For the region of the African Union, see Regions of the African Union § North. North Africa is a region encompassing the northern portion of the African continent. There is no singularly accepted scope for the region, and it is sometimes defined as stretching from the Atlantic shores of Morocco in the west, to Egypt's Suez Canal and the Red Sea in the east. Others[Like whom?] 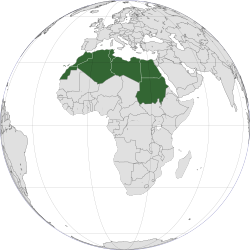 have limited it to the North West African countries of Algeria, Morocco, and Tunisia, a region that was known by the French during colonial times as "Afrique du Nord" and is known by all Arabs as the Maghreb ("West", The western part of Arab World). The most commonly accepted definition includes Algeria, Sudan, Morocco, Tunisia, Libya and Egypt, the 6 countries that shape the top North of the African continent. Meanwhile, "North Africa", particularly when used in the term North Africa and the Middle East, often refers only to the countries of the Maghreb and Libya. Egypt, being also part of the Middle East, is often considered separately, due to being both North African and Middle Eastern at the same time. North Africa has three main geographic features: the Sahara desert in the south, the Atlas Mountains in the west, and the Nile River and delta in the east. The Atlas Mountains extend across much of northern Algeria, Morocco, and Tunisia. These mountains are part of the fold mountain system that also runs through much of Southern Europe. They recede to the south and east, becoming a steppe landscape before meeting the Sahara desert, which covers more than 75 percent of the region. The tallest peaks are in the High Atlas range in south-central Morocco, which has many snow-capped peaks. South of the Atlas Mountains is the dry and barren expanse of the Sahara desert, which is the largest sand desert in the world. In places the desert is cut by irregular watercourses called wadis—streams that flow only after rainfalls but are usually dry. The Sahara’s major landforms include ergs, large seas of sand that sometimes form into huge dunes; the hammada, a level rocky plateau without soil or sand; and the reg, a level plain of gravel or small stones. The Sahara covers the southern part of Algeria, Morocco and Tunisia, and most of Libya. Only two regions of Libya are outside the desert: Tripolitania in the northwest and Cyrenaica in the northeast. Most of Egypt is also desert, with the exception of the Nile River and the irrigated land along its banks. The Nile Valley forms a narrow fertile thread that runs along the length of the country. Sheltered valleys in the Atlas Mountains, the Nile Valley and Delta, and the Mediterranean coast are the main sources of fertile farming land. A wide variety of valuable crops including cereals, rice and cotton, and woods such as cedar and cork, are grown. Typical Mediterranean crops, such as olives, figs, dates and citrus fruits, also thrive in these areas. The Nile Valley is particularly fertile, and most of the population in Egypt live close to the river. Elsewhere, irrigation is essential to improve crop yields on the desert margins. 63 Tunis $41,869 $11,634 Tunisian dinar Parliamentary republic Arabic, French is commonly used. Variously the Sudan and Western Sahara are considered to be part of the region by the United Nations, while Western Sahara and Mauritania (but not Sudan) are included by the African Union. In general geopolitical and business usage, as for example with the World Bank, North Africa is often grouped with the Middle East under the acronym MENA ("Middle East and North Africa") and sometimes in American governmental usage the geopolitical term Greater Middle East. Similarly, the traditional Arabic toponym Maghreb (meaning "the West") is commonly used to mean the African part of the Arab World, though usually with the exclusion of Egypt. The inhabitants of the Spanish Canary Islands are of mixed Spanish and North African Berber ancestry, and the people of Malta are of North African ancestry and speak a derivative of Arabic. But these areas are not generally considered part of North Africa, but rather Southern Europe, due to their European-based cultures and religion. The inhabitants of North Africa are roughly divided in a manner corresponding to the principal geographic regions of North Africa: the Maghreb, the Nile valley, and the Sahel. The Maghreb or western North Africa on the whole is believed to have been inhabited by Berbers since at least 10,000 B.C., while the eastern part of North Africa or the Nile Valley has mainly been home to the Egyptians. Ancient Egyptians record extensive contact in their Western desert with people that appear to have been Berber or proto-Berber. As the Tassili n'Ajjer and other rock art findings in the Sahara have shown, the Sahara also hosted various populations before its rapid desertification in 3500 B.C and even today continues to host small populations of nomadic trans-Saharan peoples. In the eleventh century, the Banu Hilal invaded the North African plains and plateaus, but not the mountainous areas such as the Tell Atlas range, the Rif or the Aurès Mountains and brought with them Hilalian dialects of Arabic, which over the centuries have been in significant contact with other languages, including the languages of Europe. 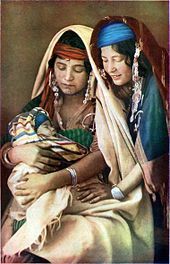 They have contributed to the Arabized Berber populations. The official language or one of the official languages in all of the countries in North Africa is Arabic. Today, the largest ethnic groups in North Africa are Arabs, Berbers and West Africans. The region is predominantly Muslim with a Jewish minority in Morocco and Tunisia and significant Christian minority—the Copts—in Egypt, Algeria, Morocco and Tunisia. The people of the Maghreb and the Sahara regions speak Berber languages and several varieties of Arabic and almost exclusively follow Islam. The Arabic and Berber languages are distantly related, both being members of the Afroasiatic language family. The Tuareg Berber languages are notably more conservative than those of the coastal cities. Over the years, Berbers have been influenced by contact with other cultures: Greeks, Phoenicians, Egyptians, Romans, Vandals, Arabs, Europeans and Africans. The cultures of the Maghreb and the Sahara therefore combine indigenous Berber, Arab and elements from neighboring parts of Africa and beyond. In the Sahara, the distinction between sedentary oasis inhabitants and nomadic Bedouins and Tuaregs is particularly marked. The diverse peoples of North Africa are usually categorized along ethno-linguistic lines. In the Maghreb, where Arab and Berber identities are often integrated, these lines can be blurred. Some Berber-speaking North Africans may identify as "Arab" depending on the social and political circumstances, although substantial numbers of Berbers (or Amazighen) have retained a distinct cultural identity which in the 20th century has been expressed as a clear ethnic identification with Berber history and language. Arabic-speaking Northwest Africans, regardless of ethnic background, often identify with Arab history and culture and may share a common vision with other Arabs. This, however, may or may not exclude pride in and identification with Berber and/or other parts of their heritage. Berber political and cultural activists for their part, often referred to as Berberists, may view all Northwest Africans as principally Berber, whether they are primarily Berber- or Arabic-speaking. Egyptians over the centuries have shifted their language from Egyptian (in its late form, varieties of Coptic) to modern Egyptian Arabic while retaining a sense of national identity that has historically set them apart from other people in the region. Most Egyptians are Sunni Muslim, although there is a significant minority of Coptic Christians. Due to the recent African origin of modern humans, the history of Prehistoric North Africa is important to the understanding of pre-hominid and early modern human history in Africa. The earliest inhabitants of central North Africa have left behind significant remains: early remnants of hominid occupation in North Africa, for example, were found in Ain el Hanech, near Saïda (c. 200,000 BCE); in fact, more recent investigations have found signs of Oldowan technology there, and indicate a date of up to 1.8 million BC. The cave paintings found at Tassili n'Ajjer, north of Tamanrasset, Algeria, and at other locations depict vibrant and vivid scenes of everyday life in central North Africa during the Neolithic Subpluvial period (about 8000 to 4000 BCE). Some parts of North Africa began to participate in the Neolithic revolution in the 6th millennium BC, just before the rapid desertification of the Sahara around 3500 B.C. due to a tilt in the Earth's orbit. While Egypt due to the early civilizations of Ancient Egypt entered historicity by the Bronze Age, the Maghreb remained in the prehistoric period longer. Some Phoenician and Greek colonies were established along the Mediterranean coast during the 7th century BC. 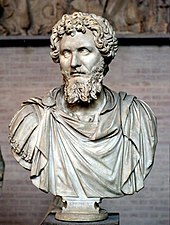 The most notable nations of antiquity in western North Africa are Carthage and Numidia. The Phoenicians colonized much of North Africa including Carthage and parts of present-day Morocco (including Chellah, Essaouira and Volubilis). The Carthaginians were of Phoenician origin, with the Roman myth of their origin being that Dido, a Phoenician princess, was granted land by a local ruler based on how much land she could cover with a piece of cowhide. She ingeniously devised a method to extend the cowhide to a high proportion, thus gaining a large territory. She was also rejected by the Trojan prince Aeneas according to Virgil, thus creating a historical enmity between Carthage and Rome, as Aeneas would eventually lay the foundations for Rome. Ancient Carthage was a commercial power and had a strong navy, but relied on mercenaries for land soldiers. The Carthaginians developed an empire in the Iberian Peninsula and Sicily, the latter being the cause of First Punic War with the Romans. The Great Mosque of Kairouan in Tunisia, founded by Arab general Uqba ibn Nafi in 670, is one of the oldest and most important mosques in North Africa. The early Muslim conquests included North Africa by 640. By 700, most of North Africa had come under Muslim rule. Indigenous Berbers subsequently started to form their own polities in response in places such as Fez and Sijilmasa. In the eleventh century, a reformist movement made up of members that called themselves the Almoravid dynasty expanded south into Sub-Saharan Africa. North Africa's populous and flourishing civilization collapsed after exhausting its resources in internal fighting and suffering devastation from the invasion of the Banu Sulaym and Banu Hilal. Ibn Khaldun noted that the lands ravaged by Banu Hilal invaders had become completely arid desert. After the Middle Ages the area was loosely under the control of the Ottoman Empire, except Morocco. The Spanish Empire conquered several coastal cities between the 16th and 18th centuries. After the 19th century, the imperial and colonial presence of France, the United Kingdom, Spain and Italy left the entirety of the region under one form of European occupation. In 2010–2011 massive protests swept the region leading to the overthrow of the governments in Tunisia and Egypt, as well as civil war in Libya. Large protests also occurred in Algeria and Morocco to a lesser extent. Many hundreds died in the uprisings. This uprising is commonly referred to as the "Arab spring"
Oil rigs are scattered throughout the deserts of Libya and Algeria. Libyan oil is especially prized because of its low sulfur content, which means it produces much less pollution than other fuel oils. ^ Mattar, Philip (June 1, 2004). Encyclopedia of the Modern Middle East and North Africa. Macmillan Reference USA. ISBN 9780028657691. ^ "Figure 5: United Nations definition of African Regions: West, Northern,..." ResearchGate.net. Retrieved 10 August 2018. 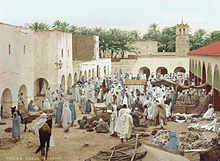 ^ es-Sadi, Abderrahman (1898). Tarikh es soudan (in Arabic). Paris E. Leroux. ^ Andrew, McGregor (2001). "The Circassian Qubbas of Abbas Avenue, Khartoum: Governors and Soldiers in 19th Century Sudan" (PDF). Nordic Journal of African Studies. ^ "North Africa and the African Transition Zone". ^ Güney, Aylın; Gökcan, Fulya (February 2012). "The 'Greater Middle East' as a 'Modern' Geopolitical Imagination in American Foreign Policy". Geopolitics. 15: 22–38. doi:10.1080/14650040903420370. ^ Balter, Michael (2011-01-07). "Was North Africa the Launch Pad for Modern Human Migrations?". Science. 331 (6013): 20–23. Bibcode:2011Sci...331...20B. doi:10.1126/science.331.6013.20. PMID 21212332. ^ Cruciani, Fulvio; Trombetta, Beniamino; Massaia, Andrea; Destro-Bisol, Giovanni; Sellitto, Daniele; Scozzari, Rosaria (2011). "A Revised Root for the Human y Chromosomal Phylogenetic Tree: The Origin of Patrilineal Diversity in Africa". The American Journal of Human Genetics. 88 (6): 814–818. doi:10.1016/j.ajhg.2011.05.002. PMC 3113241. PMID 21601174. ^ Hublin, Jean-Jacques; Boutakiout, Mohamed; Eggins, Stephen; Grün, Rainer; Reid, Donald J.; Tafforeau, Paul; Smith, Tanya M. (2007-04-10). "Earliest evidence of modern human life history in North African early Homo sapiens". Proceedings of the National Academy of Sciences. 104 (15): 6128–6133. Bibcode:2007PNAS..104.6128S. doi:10.1073/pnas.0700747104. PMC 1828706. PMID 17372199. ^ "World Economic Outlook Database". International Monetary Fund. 18 April 2017. ^ World Economic Outlook Database, April 2016, International Monetary Fund. Database updated on 12 April 2016. Accessed on 14 April 2016. ^ AFP (6 October 2017). "Morocco 'mule women' in back-breaking trade from Spain enclave". www.thelocal.es. Retrieved 10 February 2019. ^ "The World Bank". The World Bank. 12 October 2017. ^ "The Assembly – African Union". au.int. ^ "Refworld – Morocco: General situation of Muslims who converted to Christianity, and specifically those who converted to Catholicism; their treatment by Islamists and the authorities, including state protection (2008–2011)". Refworld.org. ^ Fahlbusch, Erwin (2003). The Encyclopedia of Christianity: J-O. Wm. B. Eerdmans Publishing. ISBN 978-0-8028-2415-8. ^ "Sahnouni 1998" (PDF). Gi.ulpc.es. Retrieved 10 August 2018. ^ "Sahara's Abrupt Desertification Started by Changes in Earth's Orbit, Accelerated by Atmospheric and Vegetation Feedbacks". Science Daily. 1999-07-12. Archived from the original on 2013-10-29. ^ C. Michael Hogan (December 18, 2007). "Volubilis – Ancient Village or Settlement in Morocco". The Megalithic Portal. Retrieved 2010-05-23. ^ Essa, Azad (February 21, 2011). "In search of an African revolution". Al Jazeera. Wikimedia Commons has media related to Northern Africa and North Africa.